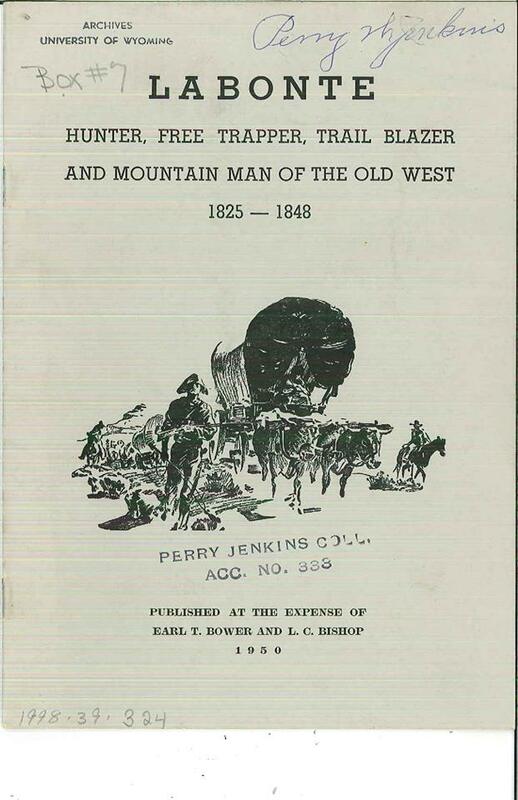 Looking through some of our archives we came across a book that once belonged to local P.W Jenkins, who petitioned for Pinedale to be part of a new county, and now has a large collection of his items in the museum. “One day LaBonte left camp for a last buffalo hunt in the mountains, preparatory to a trip to the North Fork (of the Platte) to trade his skins. Upon his return after 3 days he found his lodge burned and squaws and peltries gone. Since he was weary from his long hunt and saddened by his loss, he started a fire, and with rifle across his lap and a buffalo robe wrapped around his body, was soon asleep. During the night his squaw, Chil-co-the, who had escaped from her Arapaho captors, returned rebuilt the campfire and when morning came was seated by the fire opposite LaBonte.